An evening of Mighty Fine music!! The Mighty Fine swings at Club Hi-Fi! The Mighty Fine is one of the finest new teen combos going. 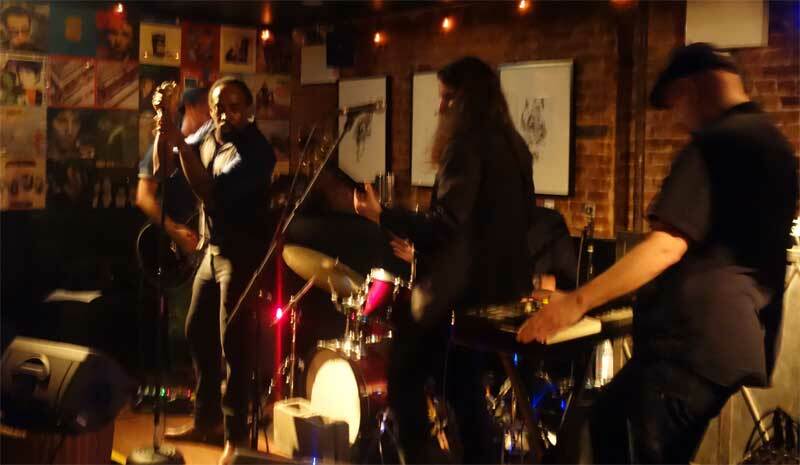 Based in Brooklyn, the group plays from time to time and always presents an exciting show. The Boogaloo Bag writers have witnessed this act on several instances, and each one it seems the group is getting better and better. The Mighty Fine is led by the mighty fine singer Steve Myers, who also sings back-up in the current touring version of The Afghan Whigs. 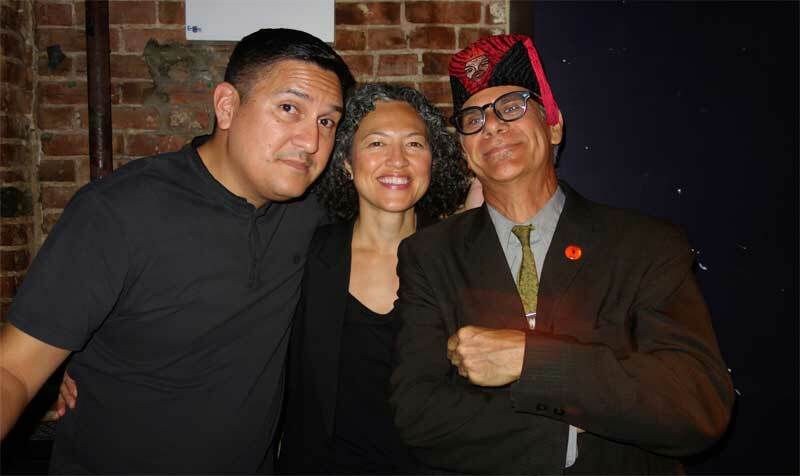 When The Mighty Fine were asked to play the rock club Hi-Fi in Manhattan on Saturday May 30, it was Mr. Myers who insisted that Phast Phreddie the Boogaloo Omnibus DJ the after show party at the club… and so it happened! 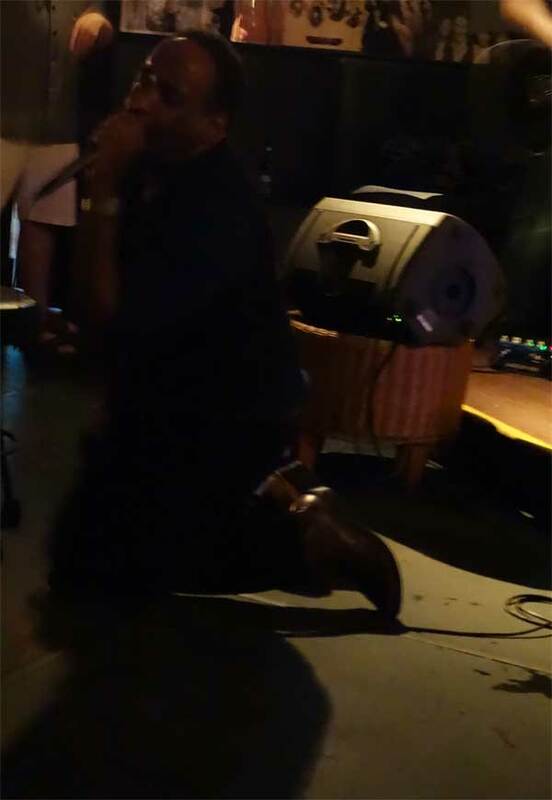 Mighty Fine singer Steve Myers emotes at Club Hi-Fi! The group is not called The Mighty Fine for nothing. The sound is good—garage-tinged modern rock occasionally spiced up with a funk rhythm—and Mr. Myers is a singer who is totally immersed in R&B from the eighties. This is not a bad thing; such acts as The Gap Band, Maze and of course Prince made terrific records back then. While waiting for the group’s next gig, the Boogaloo Bag writers suggest to the reader to find a copy of Mighty Fine’s LP Get Up to Get Down (Drug Front Records) and dig it. Speaking of the eighties, this event was also notable for the appearance of some mighty fine familiar faces that go back to The Boog’s California days. Greg De La Peña and his lovely wife Melissa were at the gig, sat as close as possible to The Boog as he spun his platters, and thoroughly dug the scene. The Boog remembers them fondly from the era when he worked at the Rhino Record Store in Westwood; a lot of water under the bridge, but what refreshing water it is! The reunion was even nicer when, after the DJ gig, these three and Nancy “Jeannie” Gardner made their way to Stromboli’s on St. Mark’s Place and First Avenue to partake in the mighty fine pizza there! Greg, Melissa and Phast swing at Club Hi-Fi!